I am a passionate tea lover. I drink tea to relax, invigorate, celebrate, comfort, warm or cool myself, in chunky mugs or china cups or from a thermos at a picnic! So when the Novel Bakers chose The Vintage Tea Party book series for this week’s theme I was thrilled. I poured myself a cup and opened the first book, but I was not prepared for the fun and joy and inspiration each of these books held inside the clever covers! 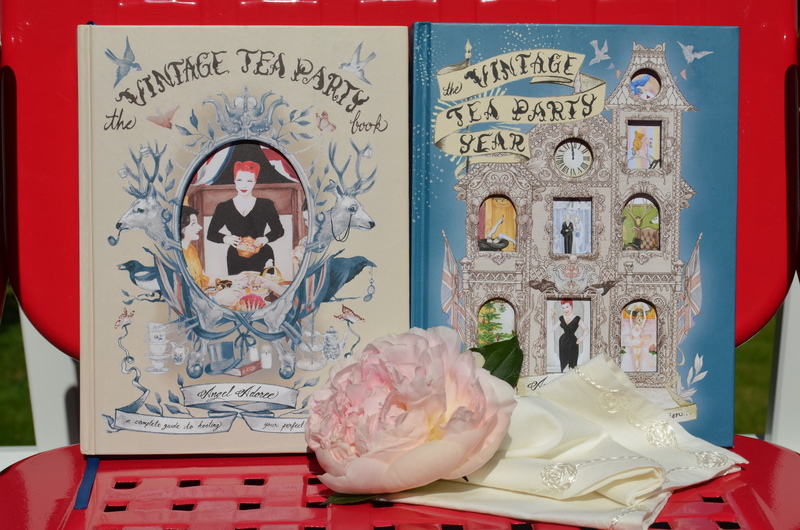 I am in love now not only with tea but with these books and their creative British author, Angel Adoree! 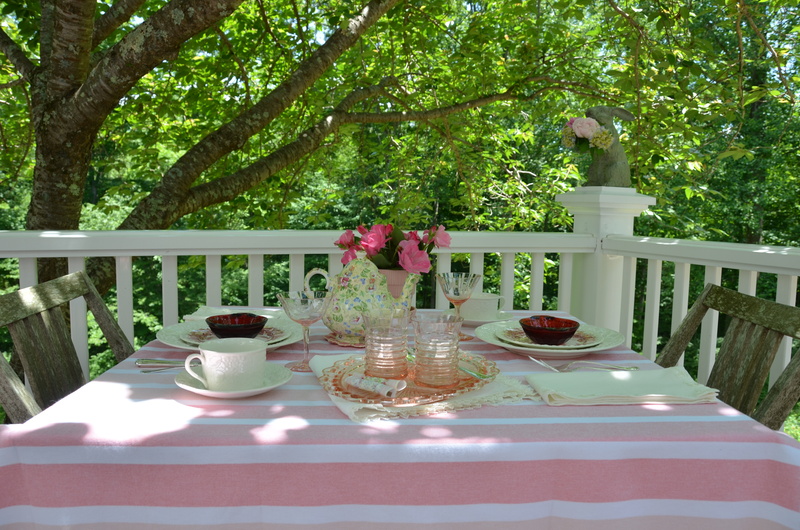 I planned to throw a very pink girly tea to celebrate two June birthdays this week, my sister and my college roomie! So using her advice I chose my invitation, props, location, and food, and a very good time was had by all! For this party props meant only dishes, linens and flowers (no hats or noise makers!). 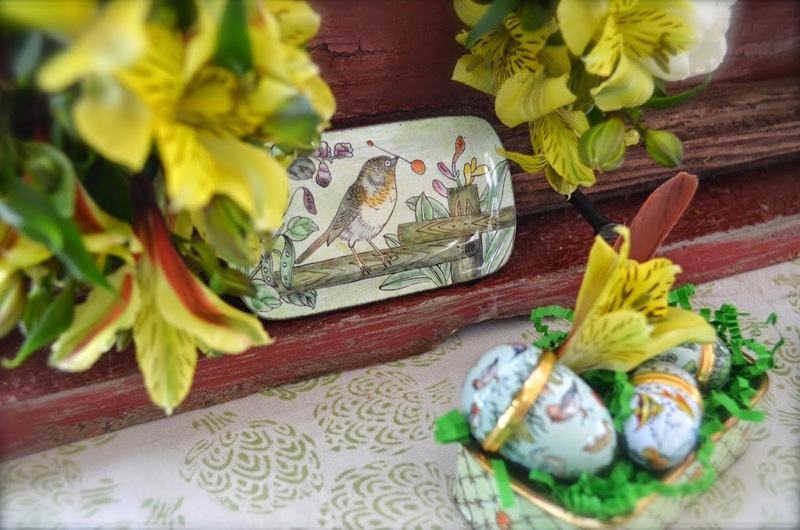 My bottomless collection of dishes includes not only things from trendy stores but lots of vintage treasures. 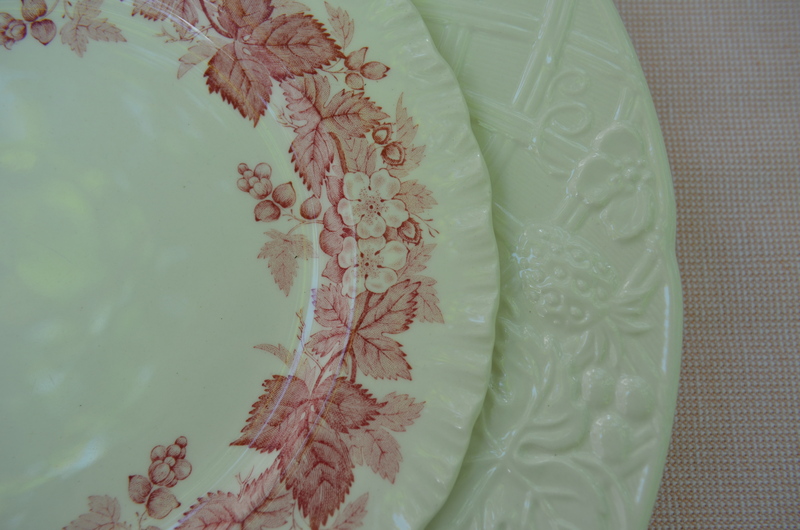 I used newer Mikasa English Countryside dishes as chargers and topped them with vintage Wedgwood Bramble luncheon plates. I really love both of these patterns. 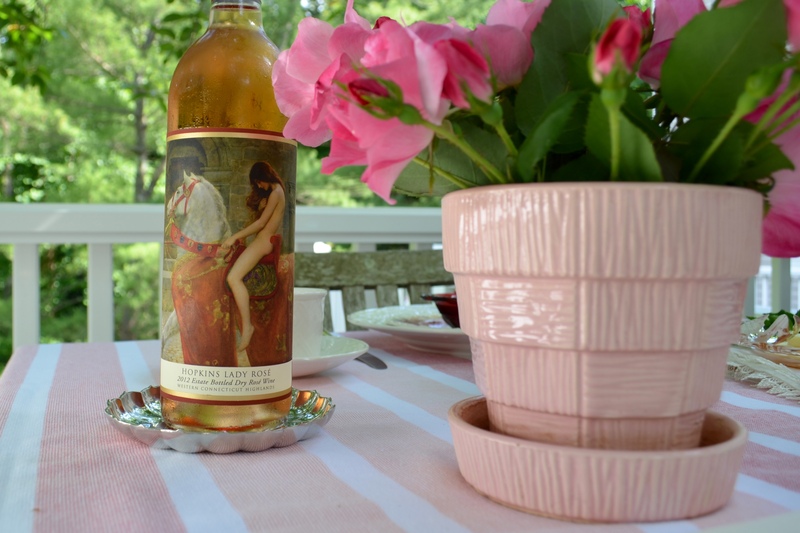 I knew I would be serving a nice crispy, fruity rosé and these pink glasses (another favorite) are so delicate and fun to use. They instantly add a feminine touch and make me sit up straight in my chair and sip my wine like a lady. 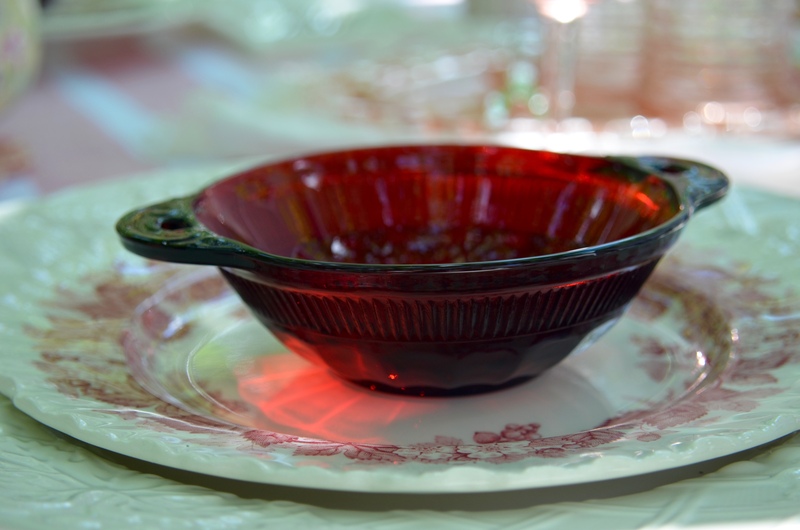 I have a serving bowl and a dozen of these vintage ruby beauties, and I use them for every special occasion. 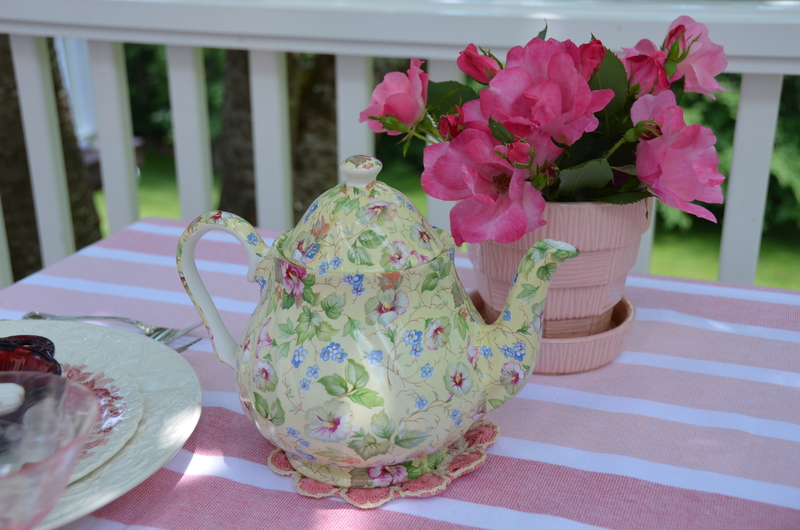 A tea party requires tea of some sort, and for this one I went very traditional with an actual English teapot. I have many teapots, but this is my very absolute favorite. I use it all the time and it makes great tea! You may have noticed my grandmother’s McCoy planter. 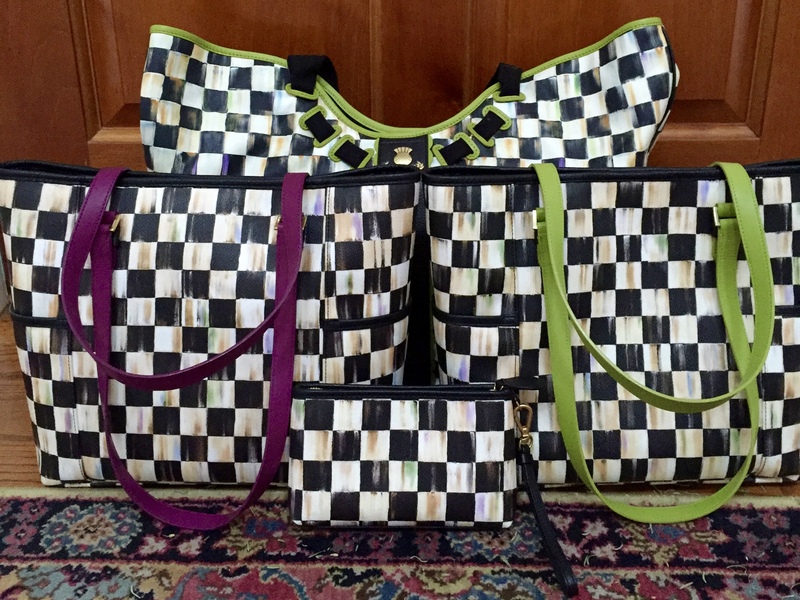 I have several from her in different colors and I love them too! 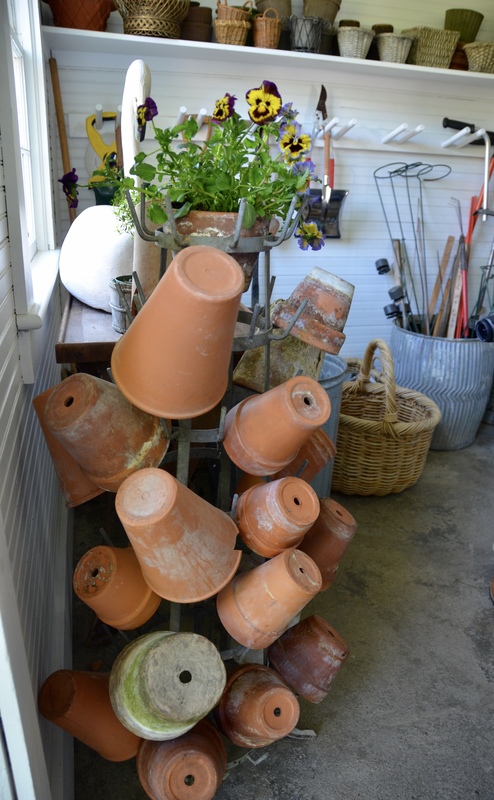 I use them as vases, with a glass liner to save them from further damage. The roses from my bushes which are finally blooming are the flower of June and of course need to be on a June birthday table! 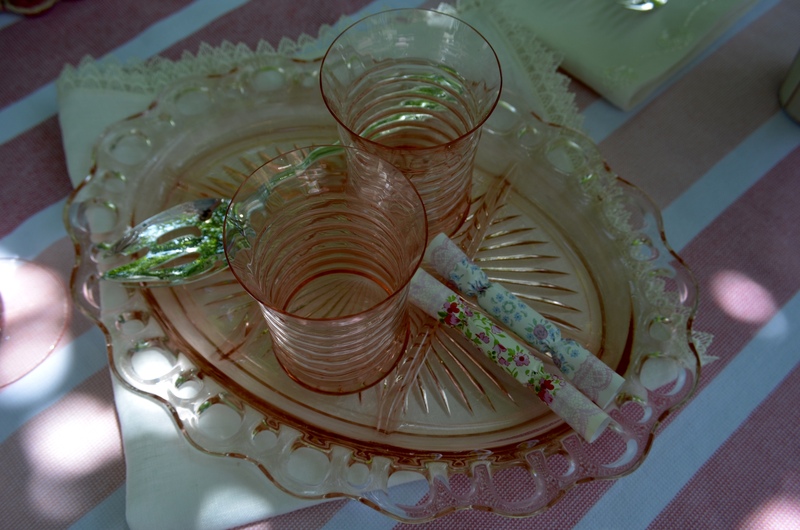 I planned to make easy finger foods and a special dessert, so I chose this depression glass platter and the 40’s era (I think) glasses. My wedding flatware (Gorham Old French) is 35 years old so I think that it will now pass as vintage! I had to add some little poppers for fun. 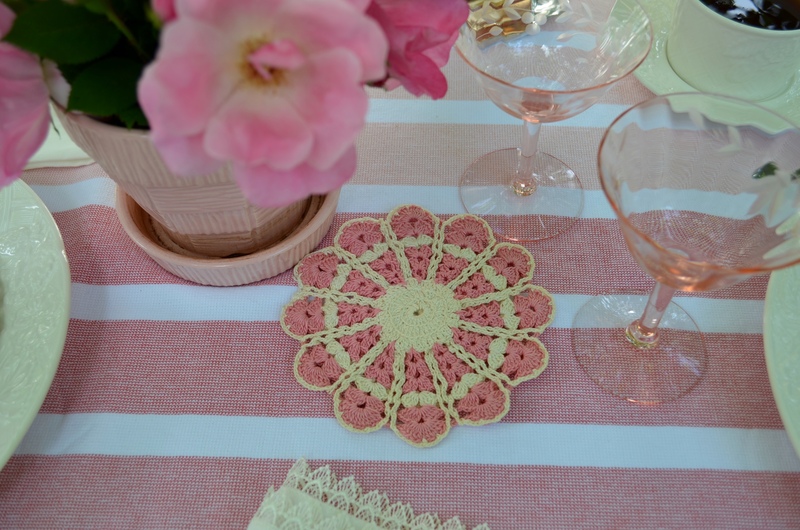 My vintage linen collection is quite lacking, so I found this new pink-striped beach throw at Terrain, and topped it with a little doily carefully crocheted long ago by my grandmother or aunt. I think the pink throw keeps everything from being a little too sweet and stiff and it is backed in terrycloth so the entire tabletop is a teeny bit cushioned. and gave the rest to my bunny to hold. As I looked a little closer at my table I realized that the easy part for me was over. But the most important part, always the hardest for me, was missing! Honestly, if someone else will cook I will happily take care of all the other elements of any party! So I started with the easiest. I already knew what would fill the wine glasses. 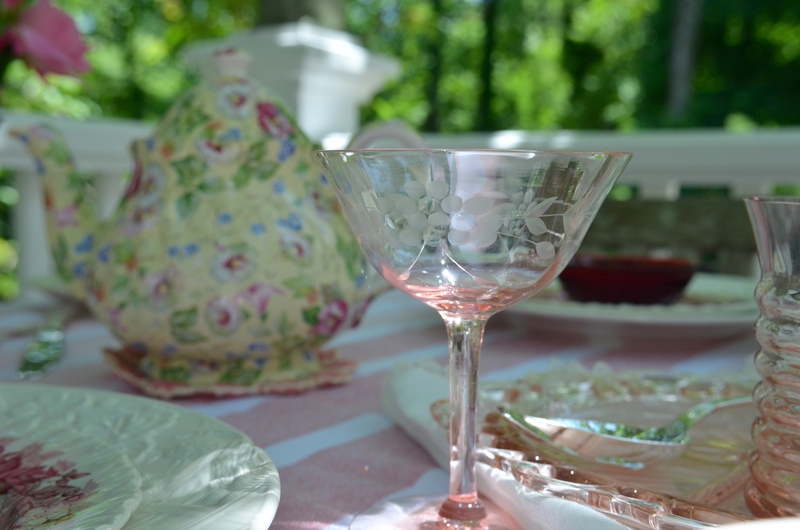 A party cannot be had with wine alone (despite what my college roomie Katie and I thought all those years ago), so I turned with some trepidation to the recipes in The Vintage Tea Party and The Vintage Tea Party Year. 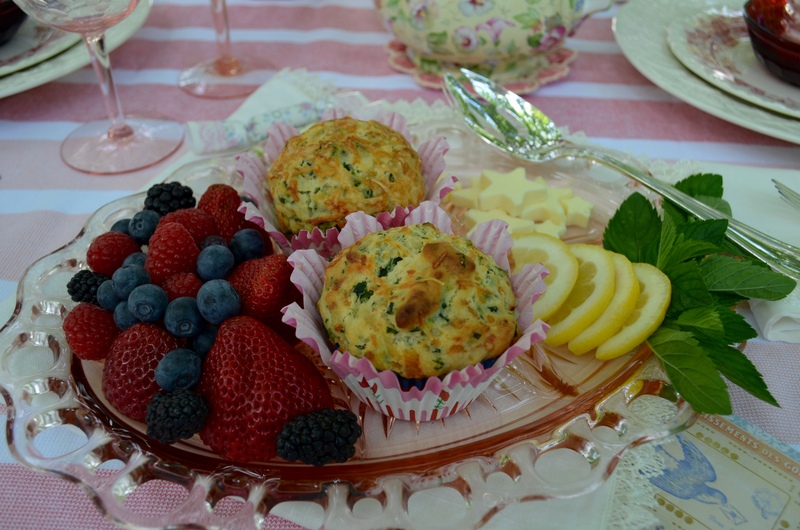 Ms. Adoree came to my rescue with delightful and easy recipes, including this one for spinach and parmesan muffins. 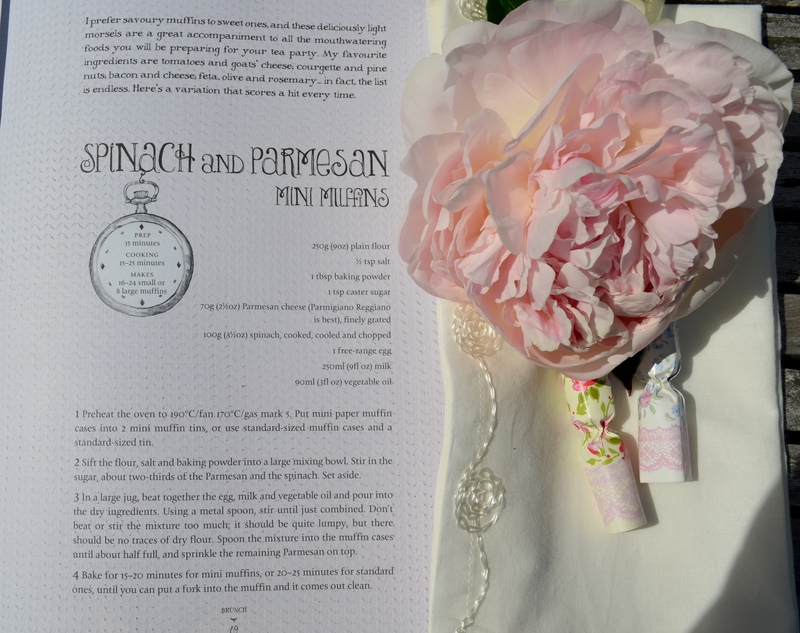 The first book, The Vintage Tea Party Book, is definitely written with a British reader in mind with the usual USA/British language barrier. I easily researched “caster sugar” and “double cream” but I was still perplexed about the measurements. I remembered (from an awful college organic chemistry class that Katie and I suffered through) that dry measurements do not convert as liquids do, for instance 9 oz. of flour is not just 1 1/8 cups, and I couldn’t for the life of me remember how to convert the 190 degree centigrade oven temp to match the numbers on my oven, BUT I found an excellent site: The Cambridge School of Culinary Arts, with conversions for everything I needed. I baked these muffins at 375, using about 1 3/4 cups flour. Butter stars are easy to make with a stick of butter and a tiny cookie cutter. Put them in the fridge to harden before serving. After this healthy and delicious meal I felt no guilt about the heavenly dessert. 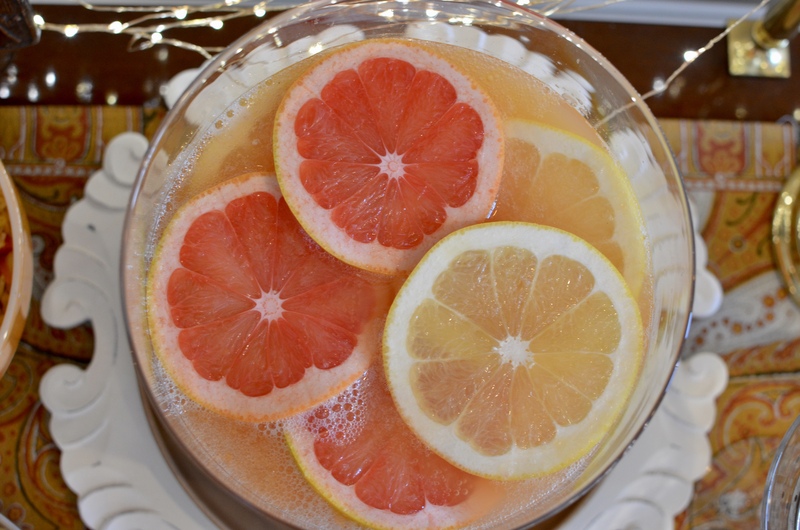 A “fool” seems like a silly thing to serve in these pretty tumblers! 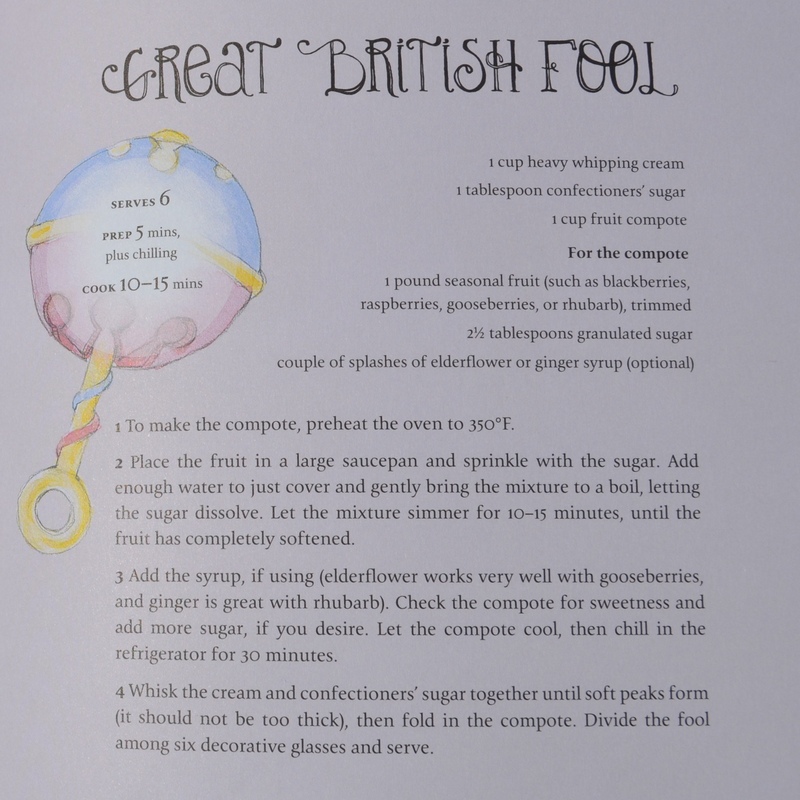 I always wondered about the word “fool” for these whipped desserts, and as Angel explains, the word is actually of French origin, fouler, to crush, as that is what we must do with the fruit! In typical British fashion the French word has been carefully adjusted to be sure no one can possibly imagine that there is anything French about this quintessentially English dessert! But I moved the fool aside and we saved it for dessert. I used raspberries and blackberries, and my fears that it would be too much and too sweet were foolish on both counts! After tasting it I was determined to extract every last bit. I seriously considered licking the glass. Really. No fooling. 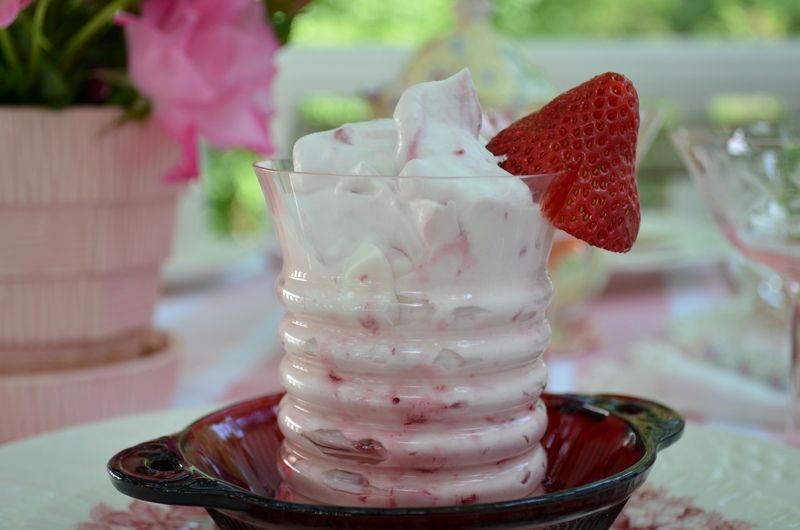 Just imagine the creamiest, lightest, just-right sweetness heavenly deliciousness. Treat yourself to this fool and also to a little fun this summer with The Vintage Tea Party series! I’ll be finding inspiration in these delightful books for a long time! My thanks to the real Novel Bakers for letting me join as Guest Baker. 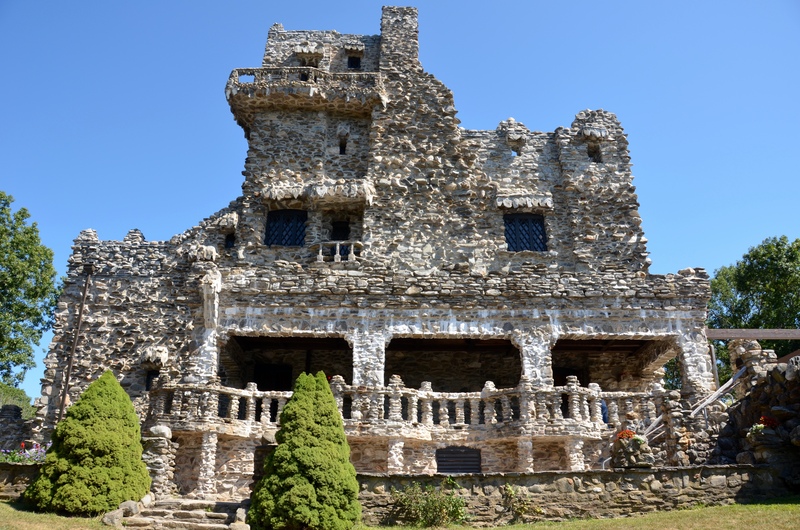 Please visit them for unbelievably beautiful props, locations, food, and photos! Ayayay! As always, there’s so much to love in your posts, Linda! I don’t know where to begin! Well, here it goes, I love the Mikasa English Countryside! When I see it in use, I want to run out and get it, then sanity prevails as the good angel on my shoulder asks how many different sets of white dishes do you “need?” But right now, the good angel is nowhere to be found, and I REALLY WANT THOSE DISHES! Those little poppers are adorable! I’d never seen them before. I wonder what tiny treasures they hold. Everything else, to be brief, is absolutely beautiful! I, too, would love it if someone else cooked for me, but these two recipes sound absolutely delicious, and very much something I’d attempt to make. What a delightful tea party! we missed you yesterday, so happy to see you jump in today! 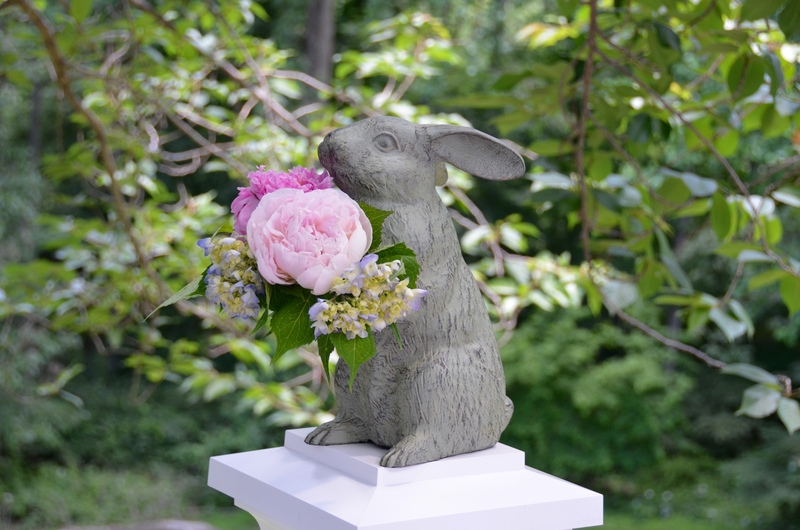 i see you an mary invited the bunnies… and peonies! i LOVE your take on her, all 3 wrapped in one indeed! i love how you laid out the 4 basics, i wanted to convey that too, but something so streamlined never entered my head! how fun, we both had tea parties, mine is coming on friday. love your invitation! such beautiful dishes too… the lighting on your rubys is heavenly! you are far more english than i am, look at your darling poppers! 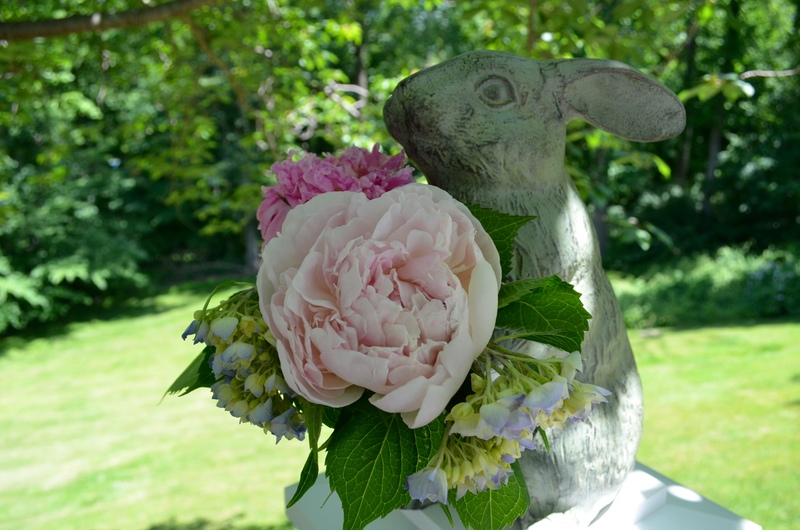 i adore the striped peony bouquet, oh it makes me so miss having a garden here…and your setting, dreamy! cracking up, when in doubt, start with wine 😉 you related to mary??? what a fab bottle! oh you did such a fabulous tea party, FUN FUN FUN! you embraced our books 100%, they truly are nothing but fun guides to let our creativity run wild! thanks so much for joining in, look forward to seeing you share all week long! Linda, I’m so happy to be Novel Bakering with you today! 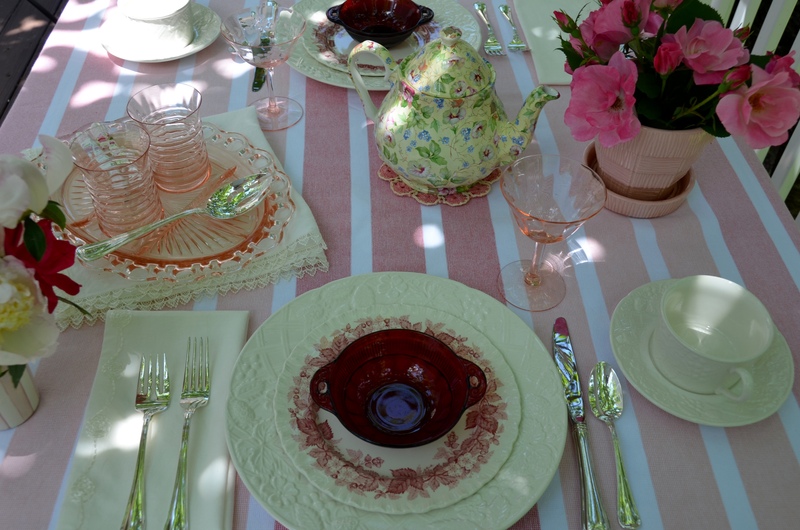 Your tea party is infused with elegance and beauty–dappled light, pale pinks, floral china, bunnies, peonies, and delicious food. I hit the same barrier with conversions, and even so, I tinkered. (Unfortunately, I tinkered too much with the rum raisin fudge, and it didn’t set.) I love the glimpses into your lovely backyard. Your props are gorgeous, and so is your styling. Enjoyed partying with you today! Well Linda, you say you are lost in the kitchen, but I would love to sit down to a plate with a spinach Parmesan muffin with a butter star and a blackberry fool, all washed down with a proper tea and a ladies rosé! 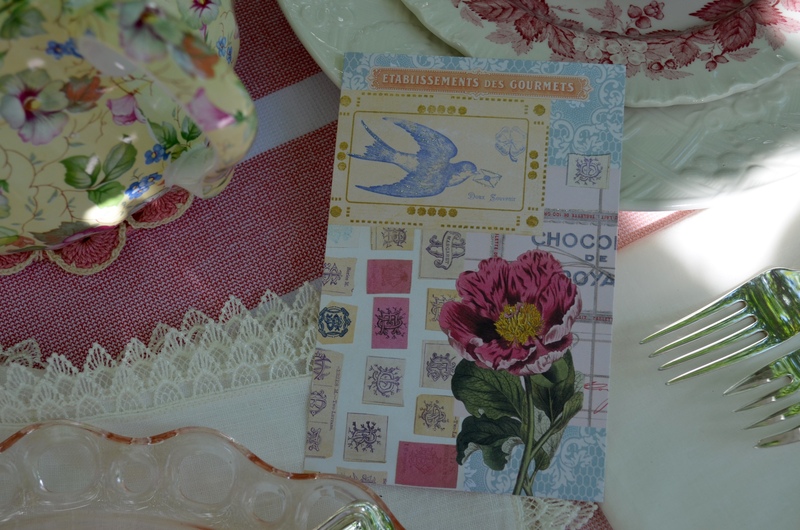 Your setting is delightful, your food looks divine, the vintage invitation is perfect, and your props, from garden peonies and blossoms to your lovely china, glass and silver are simply wonderful for this Vintage Tea party! Angel Adoree would be so proud! And Martha, Lucy, and Bette would be complemented! 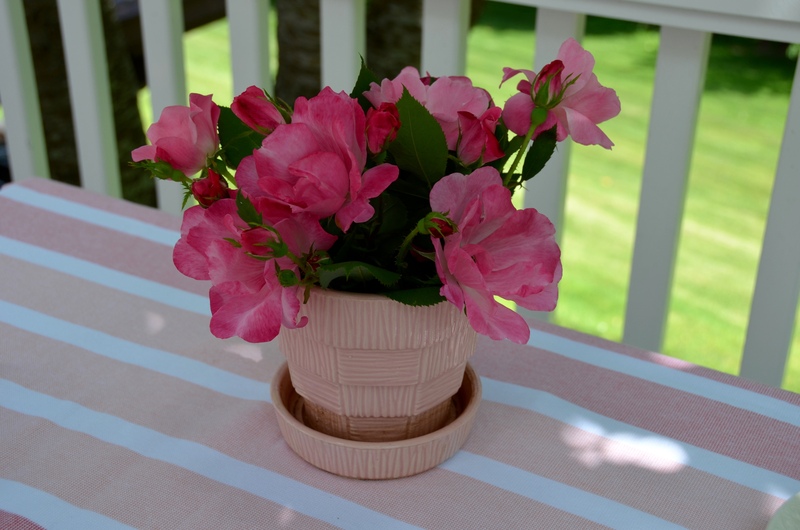 PS, I love the McK-Chs pink enamelware, never seen that before! Photos are gorgeous. I’d love to try the “fool”. Question….why does the recipe say to turn on the oven? I don’t see where the oven is used???? The fool is delicious and the only heat involved is cooking the fruit and sugar on the stove until it turns into a chunky liquid. I used the oven for the Spinach Parmesan muffins, and as the recipes were in centigrade and “gas mark” I had to do some translating. I hope you try the fool! If you do, let me know how you like it! 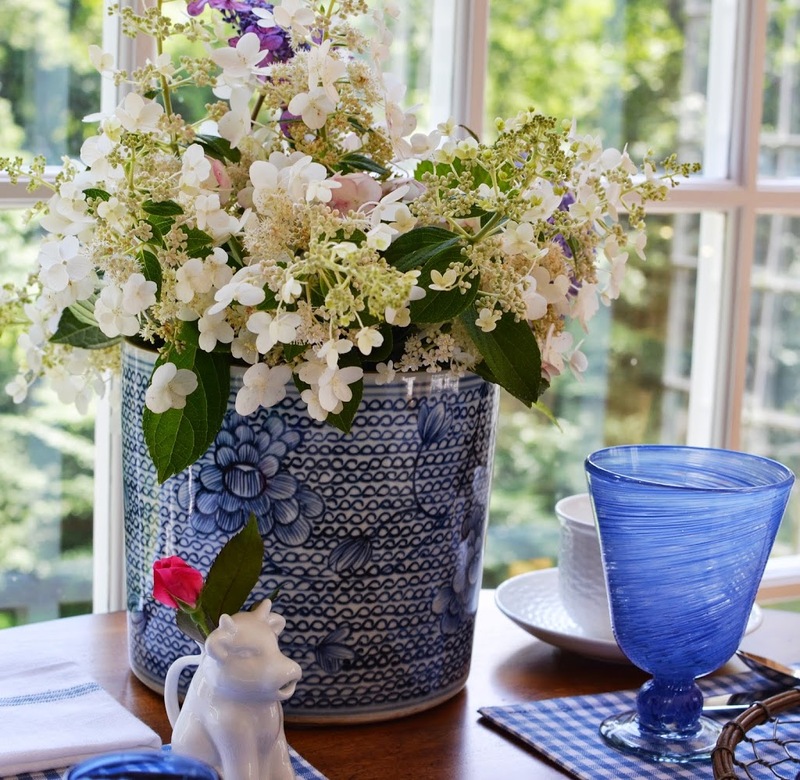 Love, love, love everything about this table…every little detail. 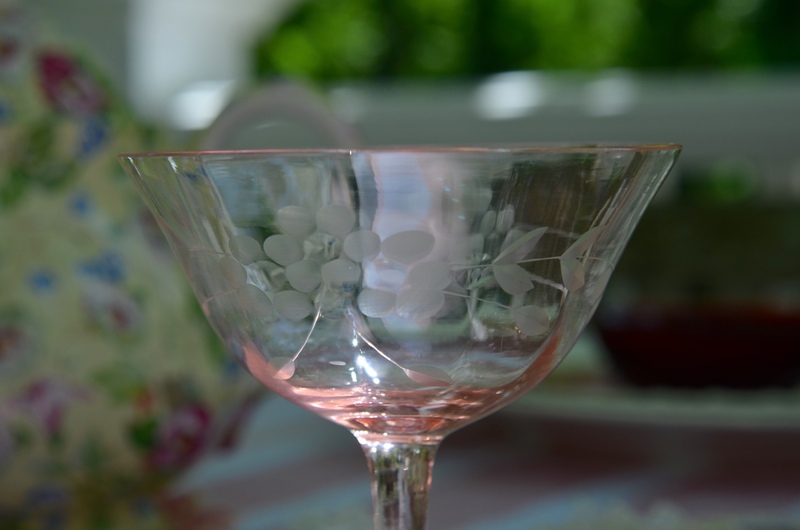 The Depression glass is gorgeous, as is the Mikasa. 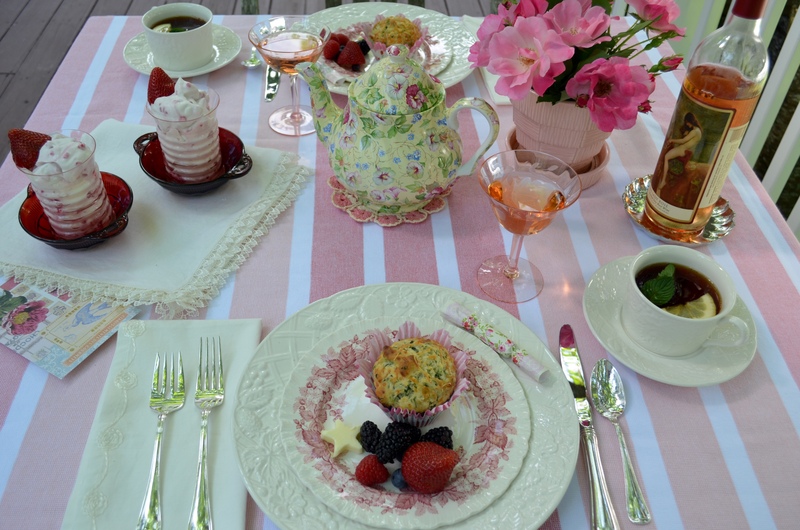 Beautiful tea party! I’d love to sit out on your deck and enjoy some of your tea party fare, Linda. 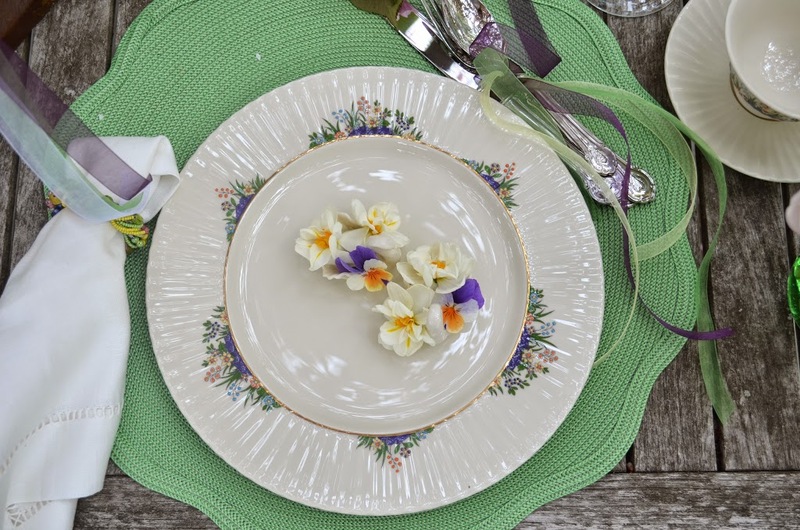 We both have the English Countryside pattern and I love how you used it for a charger for the wedgewood salad plates. The muffins look so tasty, and I’d be licking the glass, too, with that berry fool! Your teapot is a beauty, and I’m sure it does make the perfect cup of tea. 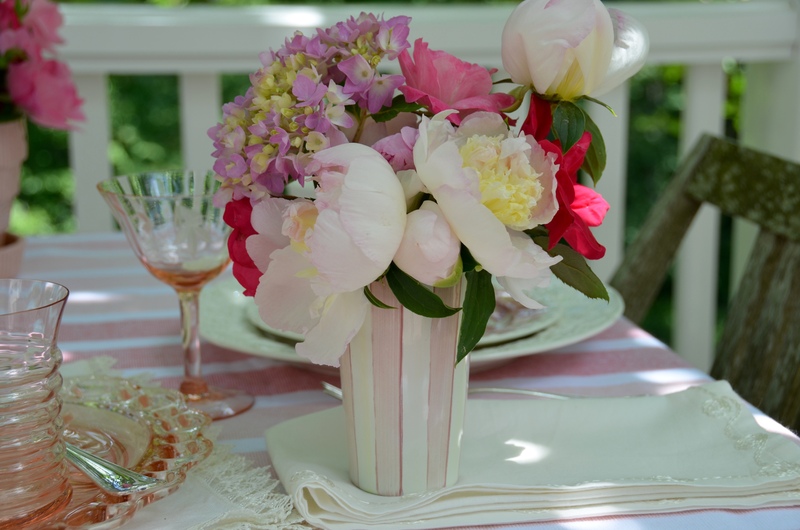 Oh, my goodness… You had me at the pink and white striped tablecloth! What fun you must have had pulling off this fantastic theme. Everything is just perfect! Oh, everything is so pretty and perfect. 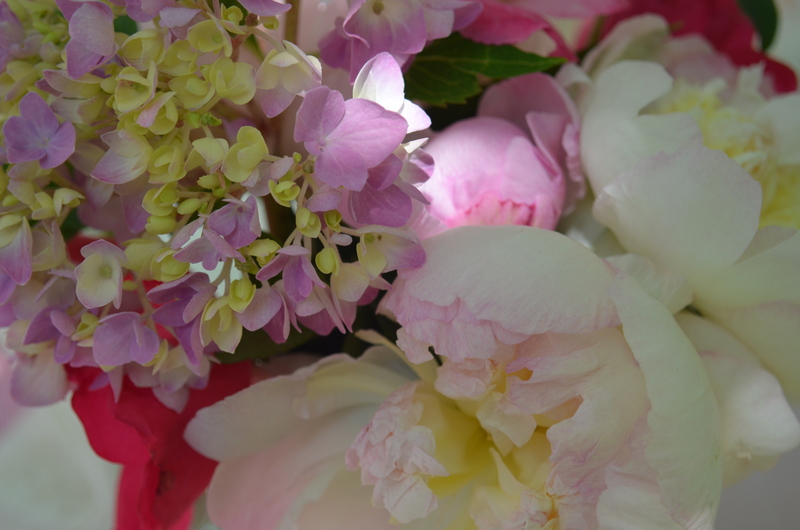 The flowers, the table setting, your dishes, the flowers – all pulled together with perfection! I don’t care what it’s called, that fool looks divine. Such lucky birthday celebrants to have this tea party thrown in their honor and luck us that you shared! So it took me a while to grasp the meaning of “novel bakers”. Hee! 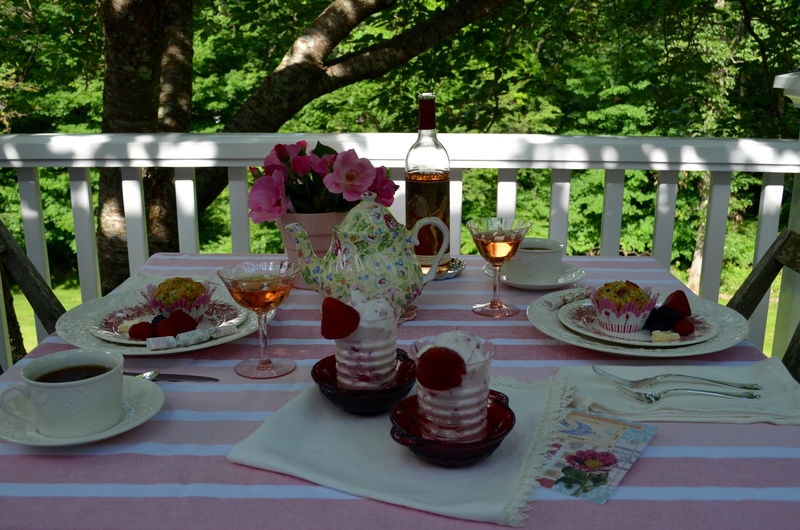 Your outdoor birthday tea is amazing! Angel Adoree would definitely approve! Oh my! What an absolute lovely afternoon tea. 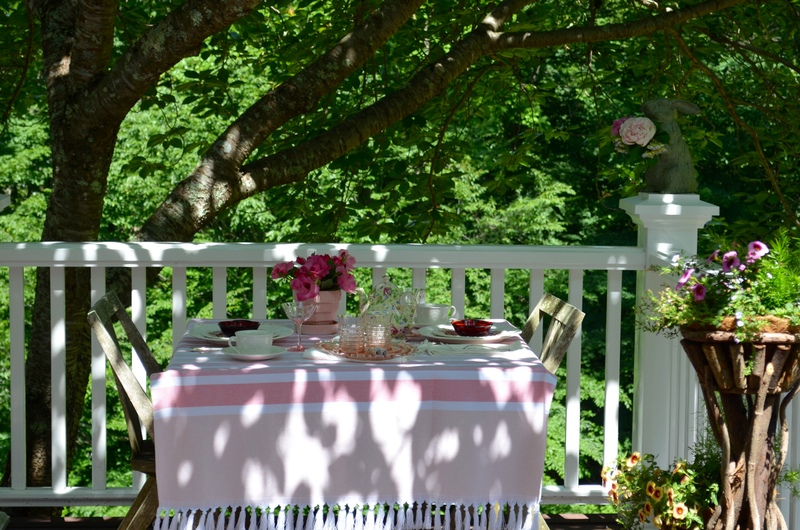 Every detail is gorgeous including having tea outdoors under a shade tree. I must try some of the recipes. 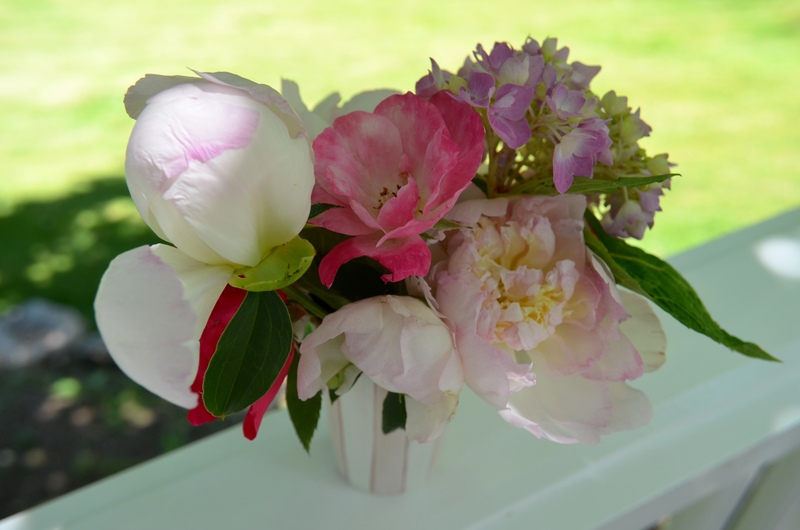 Love the vintage china and fresh flowers from your garden. Thank you for sharing. Absolutely beautiful in every detail. I lingered and loved it all. Your table looks so lovely. The teapot reminds me of a Crownford one I recall from many years ago! Thanks for sharing all the lovely food items too. I love this post, and I have all three of Angel Adoree’s books. 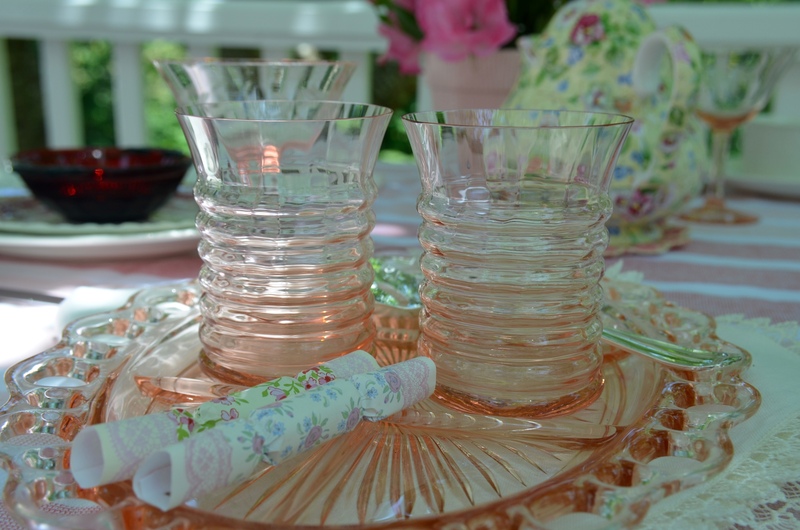 Your vintage tea party is so lovely….. 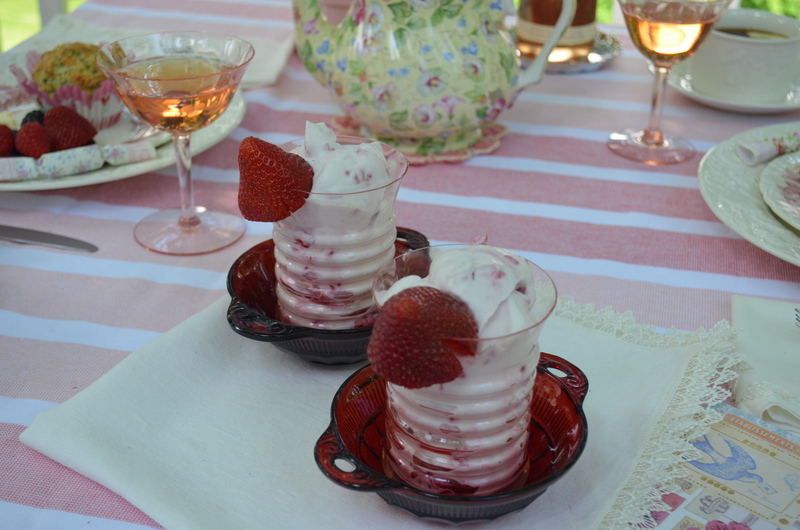 I would love to participate….how do you become a novel baker? I read and bake a whole lot!